Last Updated: 8/16/2012 | File Size: 1953 KB | Price: $27 | Downloads: 104 | Developer: Easy PDF Tools Ltd.
Easy PDF password security is trusted and reliable utility software for changing the password security of existing PDF documents. That means you can either protect your PDF files with 40-bit/128-bit encryption, or remove existing password protection. There are three operating modes available, including single PDF file, batch PDF files and hot directory. 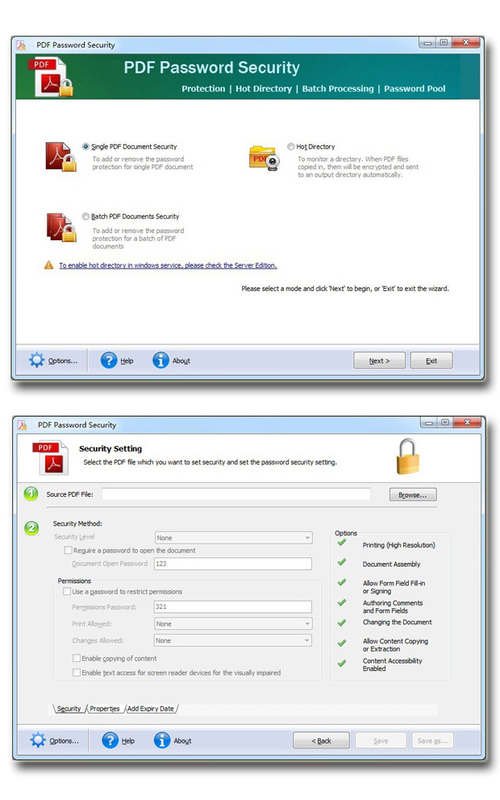 Easy PDF Password Security is a standalone program, requiring no other software to support, and it can work under almost all Windows systems, including Windows 98,ME, NT, 2000, XP, VISTA and 7. Also it supports encrypt or decrypt PDF files which are up to Adobe 9 version. Statement: First, please download the orginal installation package by clicking the download link. Of course you may also download it from the publisher's website. Using Easy PDF Password Security crack, key, patch, serial number, registration code, keygen is illegal. The download file hosted at publisher website. We do not provide any download link points to Rapidshare, Hotfile, Depositfiles, Mediafire, Filefactory, etc. or obtained from file sharing programs such as Limewire, Kazaa, Imesh, Ares, BearShare, BitTorrent, WinMX etc. Software piracy is theft. If you like Easy PDF Password Security please buy it.